New exhibition is up at the Masur Museum, and will be on display until Jan 28, 2012. Very very inspiring! 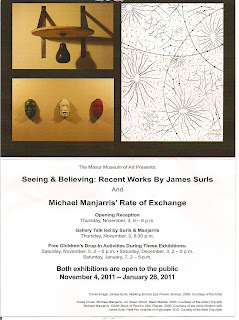 I especially enjoyed the work of Michael Manjarris and how he incorporated the use of cotton and dried cotton bolls. Ive seen crops of cotton growing up my whole life and never sat back to think about how to incorporate it into art. Art really is all around us!!! If you have some free time, go by and check out this work-well worth it. Love your blog. I hope you add photos of your murals to this site as they are part of Louisiana history; a teaching avenue in art.